Some bands spend their whole career looking for their signature sound but New Modern Angels started by doing just that. 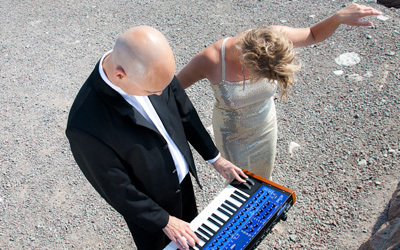 Linnea and Christian produced a low key solution to the eternal problem of mixing soft female vocals with harsh electronic sounds that struck a chord with lovers of electronica all over the planet. Participating on numerous samplers has also helped spread the word of their unique style. Linnea has also supplied vocals for several other bands, Quelles Paroles and Diskodiktator to name just a few. Track: "Det syns ingen snö"
Track: "I'll Have It All (Sonnert Remix)"
Track: "I'll Have It All"